We’d love your help. Let us know what’s wrong with this preview of I am Dreaming of... Animals of the Native Northwest by Melaney Gleeson-Lyall. The First Nations oral traditions of telling stories and singing lullabies to our babies and children have been passed on from generation to generation. 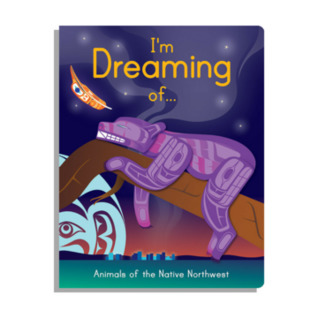 I am Dreaming of Animals of the Native Northwest shares shares rich, cultural art pictures and the poetic cadence will bring a calmness to every child's heart. Melaney Gleeson-Lyall (Point) is a Musqueam, Coast Salish artis The First Nations oral traditions of telling stories and singing lullabies to our babies and children have been passed on from generation to generation. To ask other readers questions about I am Dreaming of... Animals of the Native Northwest, please sign up. I really liked the way the artwork was incorporated, especially with the racoon. It does take on kind of a dreamlike quality. I think this book is age appropriate for kindergarten or first graders. It is a simple book telling about the animals in the Native Northwest and what they might be doing. The illustrations are very well done. I could use this book to introduce an animal unit. Something that may be beneficial is that there seem to be native patterns on the animals, this could allow students to become a little bit more familiar with them. This book is full of animals in the Native Northwest and the most colorful well illustrated pictures that will capture any reader's attention no matter their age. This book is helpful in teaching students to see the world in a whole new way and to explore. Also that different cultures and places in the world are so beautiful. This is a catchy story with a poetic tune to it. It is about being grateful and noticing what's around you. This story is about being grateful for all living things and reconnecting with your loved ones. It is best for a bedtime story, but it holds a much deeper meaning as well. I think this book is good for students because it is an important lesson for kids. The illustrations are absolutely the main focus of this story! They are beautiful, bright, and colorful! I know they definitely caught my eye as I was reading the story! I wanted to make sure I looked at every single detail before I turned to the next page. This is a great book for young readers! Beautiful illustrations and the words are done in a calming cadence to help settle down for bed. This lovely board book shares cultural art in bright colours and bold shapes to introduce little ones to the animals of the Pacific Northwest. Beautiful illustrations throughout the whole book! It was very peaceful and pretty. The words are done in a calming way. This could help settle down for bedtime too. The excellence of this book is in the incredible artwork. The illustrations are simply stunning! This book was a Picture Book Honor Book for the 2018 American Indian Library Association's Youth Literature Award. I love the bright colorful illustrations! Okay, wasn't really focusing on the text (I know, right? who am I?) and forgot it was an "I'm dreaming of..." book until I hit the last page ("I am dreaming of... sleeping under the moonlight"), and I maybe wouldn't have picked such high-energy brightly-colored illustrations for a bedtime book, but this book just makes me so happy. Edit 5/18/1 This book was a Picture Book Honor Book for the 2018 American Indian Library Association's Youth Literature Award. Beautifully illustrated this book would be a great bedtime story for little ones (0-3). Simple poetic lines describe the culturally rich artwork done by 7 different illustrators. Wonderful representation of the beauty of the native northwest. Could be used as part of a unit on native artwork.